International efforts to wrest a cease-fire from Israel and the Hamas-ruled Gaza Strip are gathering momentum. The two sides are putting forth widely divergent demands to halt five days of violence. The violence saw Israel launch ceaseless air, tank and warship strikes on the Strip and Hamas fire a stream of rockets into Israel, including into the Tel Aviv and Jerusalem areas. By this writing, 84 Palestinians, most of them civilians, have been killed and 720 have been wounded. Three Israeli civilians have died from Hamas rocket fire and a dozen have been wounded. President Barack Obama said he was in touch with players across the region in hopes of halting the fighting. While defending Israel's right to defend itself against the rocket fire, he also warned of the risks Israel would take if it were to expand its air assault into a ground war. UN Secretary-General Ban Ki-moon said Sunday afternoon he would head to the region and "appeal personally for ending the violence." French Foreign Minister Laurent Fabius met with Israeli Prime Minister Benjamin Netanyahu earlier in the day, and an Israeli representative was in Egypt earlier in an attempt to negotiate a peaceful settlement. Turkish Foreign Minister Ahmet Davutoglu is expected to pay a snap visit to Gaza as part of an Arab League delegation to express support and solidarity. Morocco’s King Mohammed VI has meantime ordered the immediate setting up of a Moroccan field hospital in the Gaza Strip. The hospital will comprise specialized medical units of the Royal Moroccan Armed Forces, as well as Moroccan civilian physicians and paramedics. The multidisciplinary medical-surgical hospital will reinforce existing medical facilities there. According to a senior State Department official, Egypt has an important leadership role to play in brokering a cessation of the violence between Hamas and Israel. Other than the rationales of geographic contiguity, security, stability and role, Egypt now has a regime begotten by the revolution and entrusted to the Muslim Brothers by the ballot box. Consequently, Hamas neither can nor wishes to deal with Morsi’s Egypt the way it dealt with Egypt under Hosni Mubarak. Israel’s onslaught on Gaza showed the Arab Spring did not let the Palestinian cause fall from its list of priorities. The offensive gave Arab Spring countries the chance to reiterate that injustice to the Palestinians is in their hearts and minds and will have pride of place in their priorities. The region has changed. More exactly, it is changing. Despite lingering uncertainties, apprehensions and machinations, the Arab Spring is probably the most important regional event since the 1979 Iranian Revolution. From this perspective, let’s ponder conditions in the two countries that initiated the Axis of Resistance. Iran is buckling under the weight of economic sanctions. Her role in the region is melting away after colliding with the Arab Spring, specifically in Syria. Her nuclear program is closely monitored by Western powers. Syria, the Arab partner in the Axis of Resistance, sees her regime loosing control on the ground and becoming an Arab, Islamic and international pariah. The Hamas movement, whose leadership resided in Syria, was the Sunnite link in the Axis of Resistance grouping Iran, Syria and Hezbollah. It was also the golden link in the chain because it introduced the Axis’ missiles and modus operandi to the heart of Palestinian territory. Consisting of Hamas and Islamic Jihad, the Palestinian offshoot of the Axis of Resistance played a key role over the past two 20-odd years. Hamas and Islamic Jihad helped exasperate hopes pinned on the Oslo Accords, militarize the Second Intifada, and undermine the successive clout and authority of Yasser Arafat and Mahmoud Abbas. Their suicide attacks shored up Israeli hardliners. With the two Palestinian groups tagging along, Iran and Syria were able to gain veto power on any idea of Palestinian-Israeli or Arab-Israeli peace. The Arab Spring was a bolt from the blue for Syria. But it allowed Hamas leaders residing in Damascus to nose out the Arab Spring’s Muslim Brotherhood scent. Although Hamas initially refused to take a stand for or against the Syrian uprising, it was against the grain of its political chief Khaled Meshaal to follow in Hezbollah’s suit and take orders from Iran’s Supreme Leader. Hamas consequently elected to emigrate from Damascus and align itself with the Muslim Brotherhood Supreme Guide based in Egypt. Israel’s blitz on Gaza came on the heels of such momentous changes. Israeli warplanes pummeled the Strip while Hamas and Islamic Jihad hit back with rockets targeting Tel Aviv and Jerusalem. Remarkably, Hamas hastened to tell everyone trying to broker de-escalation that the address for negotiations is Egypt. Morsi’s telephone hasn’t stopped ringing. 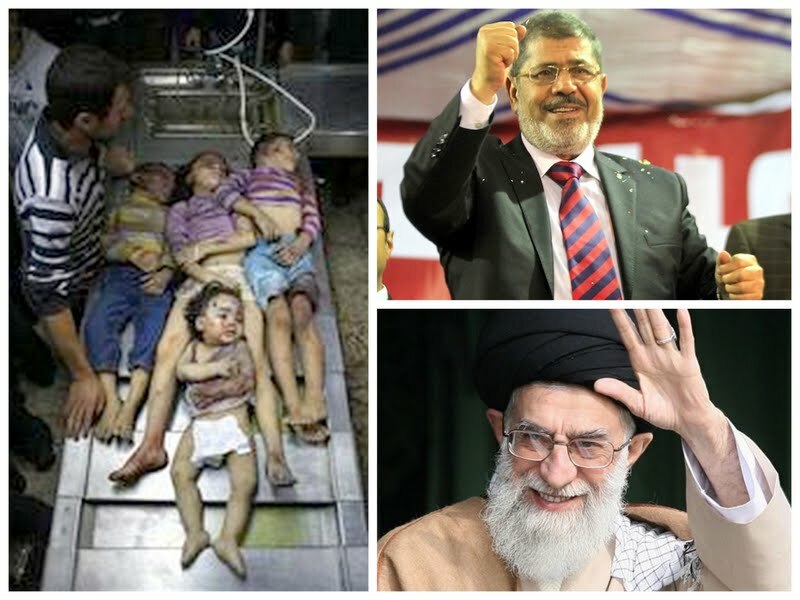 Morsi has no choice but to seek a quick return to calm and normalcy. He cannot see Hamas crushed in Gaza. And he cannot gamble away Egypt’s international ties and financial aid either. He would not risk the Brotherhood’s credentials for running Egypt.